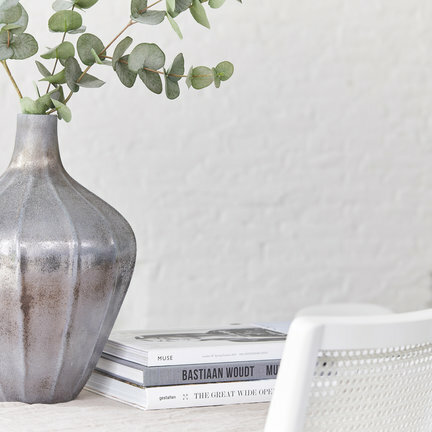 Riverdale vases are ideal for giving your interior a little extra. Vases Riverdale are available in many different shapes and sizes. Riverdale offers a wide range of Riverdale vases. Combine different vases with each other or with other Riverdale accessories to achieve a unique decoration piece for your home. Each room decorated with a vase The vases Riverdale Riverdale you create in different rooms in the house more and conviviality. Take the daily meal cozy and colorful affair through the use of the vases. Or use them as a real eye-catcher on the windowsill in the living room. Vases Riverdale combine with bijvoorbeelt hurricanes for a homey feel and some extra fun. Vases Riverdale give a nice ambience in the interior through its unique appearance and its many features. The Riverdale vases are in addition to any interior. You can brighten up these extra course with beautiful flowers, but the Riverdale vases are themselves a nice decoration piece for your house. By combining the vases, or by the use of flowers, the vases are Riverdale to all year round use. Be the vases like the pillows adjust to every season of the year. The ideal decoration to make your home more cozy. Create an authentic feeling of coziness that invites you to share with others. The vases Riverdale creates you an instant atmospheric and cozy home. A stunning eye-catcher on the table, the dresser, bookshelf or even the piano. You can combine the vases to achieve a fun and unique atmosphere in the interior. Enjoy with the Riverdale vases of fine moments in your house.